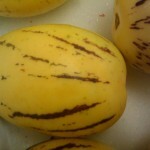 Pepino Melon are small egg shaped melon with stripes . This melon is very sweet and , has the flavor of a cantaloupe and a honeydew. Try wrapping pepino melon in prosciutto for a twist on the classic melon and prosciutto. Sprinkle lime juice on pepino melons brings out its flavor.